ASUS and Google were working towards a $200 price point, so we can't expect to find much inside the box besides the tablet itself. There's a charger with a USB port and a microUSB cable for charging and data, and that's it. To be fair, there's not much else you need for the Nexus 7, at least not for basic operation. Not to mention that other tablets (even way pricier ones) rarely have better stuffed boxes. There are some pretty fancy accessories available for separate purchase if you want to go that way. 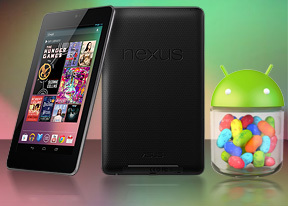 There's not much to the design of the Nexus 7. Thanks to the silver edge that runs the perimeter of the tablet, you won't mistake it for a Kindle Fire, for example, but other than that the looks of the front are fairly generic. The back is another story - the patterned dark grey plastic carries the embossed Nexus logo with pride and is really one of the better tablet backs we've seen (better than Samsung's glossy plastic backs, though not as cool as iPad's aluminum shell). The 7" screen is the key component of the Nexus 7. It's an IPS LCD unit of WXGA resolution (800 x 1280) and scratch-resistant Corning Glass (not Gorilla glass). The pixel density works out to 216ppi, the same as on the Galaxy S II, for example. It's a sharp display with good colors. It suffers certain loss of contrast when viewed at an angle, but no color shift and text remains perfectly legible. The real problem is that the display isn't very bright and it's rather reflective too, resulting in poor sunlight legibility. We measured the brightness of the Nexus 7 screen and indeed it doesn't impress - it's as bright as the Super AMOLED on the Samsung Galaxy Tab 7.7, with other LCD screens posting higher results. The native contrast isn't that bad, it's higher than that of an iPad (any generation), but not as good as some 7" droids. The thing is that due to the high reflectivity, you'll need to use the Nexus 7 in a pitch black room to see the full capabilities of the screen. We've seen several reports of issues with the Nexus 7 screen, ranging from separation (the screen protrudes slightly from the bezel) to image retention (ghostly images seen after the image on the screen has changed). Our particular unit exhibited none of the above, but it's something to be aware of. The warranty covers screen separation and dead pixels. The only camera on the Nexus 7 - a 1.2MP unit - is right above the display. Next to it is the ambient light sensor. That's it for the front, Android keys will be drawn on the screen as is the Nexus tradition since Ice Cream Sandwich. On the right side of the tablet, there's the Power/Lock key and a volume rocker just below it. It's a familiar setup but the keys themselves are not very comfortable to use. On the left, there are pogo pins for dock connectivity and a mic pinhole. The bottom of the Nexus 7 houses the 3.5mm audio jack and the microUSB port. It can be used for charging, computer connections (MTP and PTP) and has USB host enabled for connecting mice and keyboards (but not mass storage devices, you need a hack for that). On top we find the second mic pinhole. We already discussed the back, but there's one more item of interest there - the loudspeaker. Because it's so near the beveled edge of the bottom, it doesn't get muffled when you place the tablet on a level surface. Having covered what the Nexus 7 has, let's take a second to mention what it doesn't. The 4325mAh battery isn't user replaceable and there are no card slots of any kind. So, you can't expand the external memory (something to keep in mind when deciding between the 8GB and 16GB versions) and there's no mobile data. There's no TV Out either, which is a shame. We don't think the absence of a main camera at the rear is a massive omission. In fact, Google and Asus are making a statement that all you need on a tablet is a webcam and we're inclined to agree. Quality stills and HD videos are nice and all, but tablets are just the wrong shape and size for taking pictures. The Nexus 7 feels fairly light in the hand and the feel is quite nice. The tablet will fit in a pants pocket, but is uncomfortable. However, coat pockets, purses, messenger bags and so on, are more than adequate to carry the 7" tablet. We can't say the same for 10" tablets. The top and bottom screen bezel is wider than on the sides, which is good in landscape use (you can rest your thumbs there). In portrait mode you need to be a bit more careful, but the size of the Nexus 7 allows you to hold it from the back anyway.